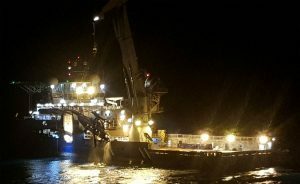 A floating crane is used to raise a Russian Mi-8 helicopter onto the deck of the SSS early Saturday morning. Photo courtesy of The Governor of Svalbard. 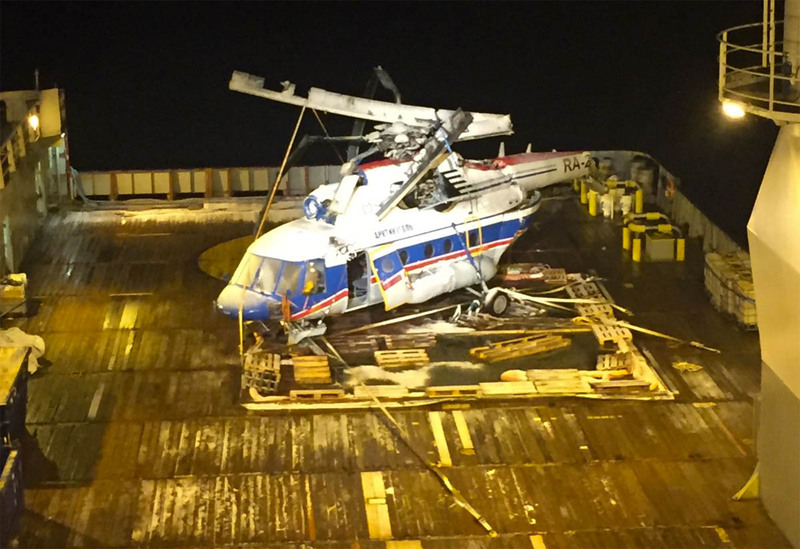 The largely intact Russian Mi-8 helicopter was raised by the Maersk Forza using a floating crane onto the ship’s deck, along with smaller parts of the aircraft that were recovered, according to a prepared statement. The cockpit voice recorder and GPS were recovered during the initial operation. The data recorder was in the tail of the helicopter, which broke off from the main fuselage, Vyacheslav Nikolayev, the Russian Consul General in Svalbard, told RIA Novosti. It had not been recovered as of early Saturday evening. The instruments will be sent to Moscow for analysis. 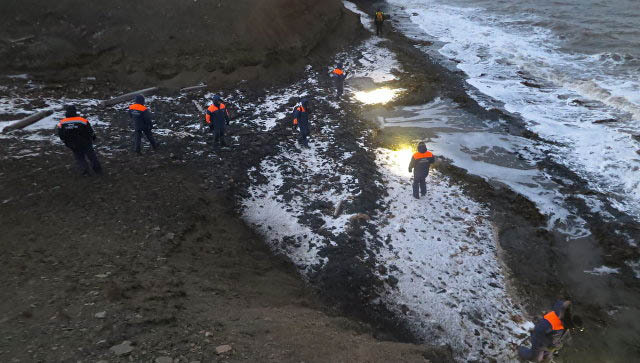 The ship arrived in Svalbard on Wednesday, but Norwegian and Russian recovery workers delayed the raising of the helicopter to conduct further analysis of the crash site and ensure no bodies were in the vicinity. Evgeny Saidov, head of the operations group from Russia’s Ministry of Emergency Situations, told Russia’s TASS news agency the lifting of the helicopter started late Friday night. “The operation was complicated by poor visibility and severe Arctic conditions,” he said. Recovery workers search the coastline near Barentsburg for the bodies of those aboard a helicopter that crashed near the settlement. Photo courtesy of the Russian Ministry of Emergency Situations. The helicopter crashed Oct. 26 about two kilometers from the Barentsburg heliport, coming to rest upside down 209 meters beneath the surface. All eight passengers are presumed dead, but only one body has been recovered.